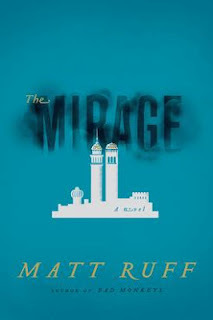 Billed as a psychological thriller, The Mirage is begins by skewing the world we know into a parallel universe where on 11/9, American terrorists hijacked planes and attacked the United Arab States, a federation encompassing most of the Middle East and North Africa. It's a promising start. And an engaging one, as Ruff manages to develop complex characters even as he presents mind-curdling twists of our reality: North America is fractured into several religious nation-states (though there's little word on what's happening in the Pacific Northwest), Timothy McVeigh is a CIA agent (that's the Christian Intelligence Agency of the Evangelical Republic of Texas), Saddam Hussein is a corrupt union leader, Osama Bin Laden is a member of the UAS Senate, and the go-to Internet reference site is The Library of Alexandria. The cultural flip raises great questions about the morality and motivation of players, both occupiers and resisters. And it's fun to see how Ruff unveils a new twist every few pages, even as the plot unfolds towards an unexpected revelation about Muslim mysticism's role in the order of things. Yet somewhere after the 300th page of this 400+ page adventure, I found myself losing interest and reading just to finish. A major character popped up, and I had no idea who he was. A climactic gun battle and a final walk toward ambiguity later, I was done, but I felt a bit cheated. Maybe it was me; perhaps I lost focus someplace in the book. But this is unusual for me, so I'm thinking it might have been the storytelling (or editing) that missed a note, or simply hurried along toward an impatient end. There's a lot to like about The Mirage, but it's not going to displace 1Q84 as my favorite recent read about mind-bending alternative realities.